We are a Brighton based company that covers a wide range of general plumbing and heating tasks. We pride ourselves very highly on customer service and working to high standards. No job too small, we are competitive with our prices and reliable. We offer a no call out fee only a repair fee and give out free quotations on work with honest advice. 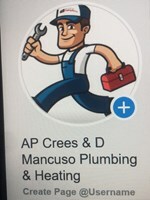 David Mancuso - fully insured plumber. Peacehaven/Seaford/East Sussex. Contact (01273 089275) contact directly to Mobile. Kitchen pipe amendment and water feeds installation. 1st fix and 2nd fix plumbing. Thanks for taking the time to view our page and we look forward to hearing from you.